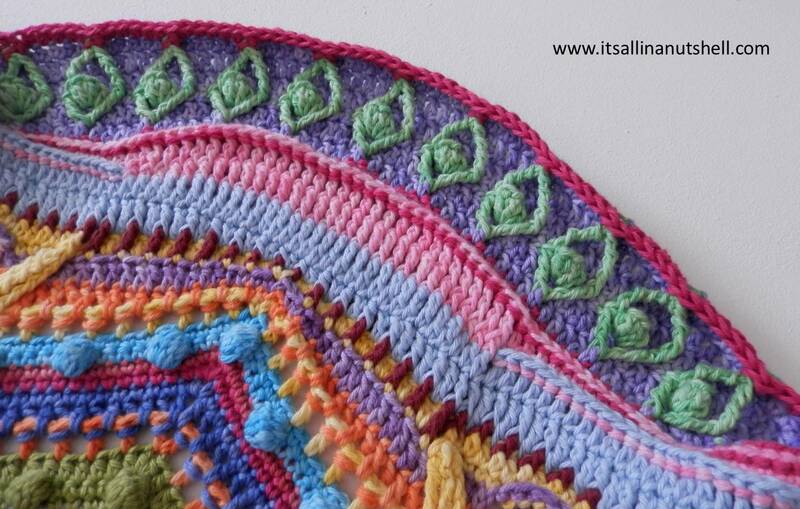 Last week was a great week of rest and relaxation with Mandala Madness by Helen Shrimpton. Not so this week. We are back in the game and there is a lot happening in part 10. This week is maybe the hardest week of the entire CAL, so if you can do this, you can do anything! You can find the original, written pattern with many translations on Helen’s blog. All videos for Mandala Madness are available through my YouTube channel and on my blog grouped on this dedicated video page. In the video for week 10 I show you how to work two colors at the same time. You are continuously changing colors to work a series of diamonds, so take it slow and make sure that you have the correct color yarn on your hook for each stitch. I use two Scheepjes yarns for my mandala; Scheepjes Sunkissed and Scheepjes Cotton 8 with a 3mm (D-3) hook. There are yarn packs available for this CAL in Scheepjes Color Crafter, Scheepjes Stone Washed XL and Scheepjes Merino Soft, available from Deramores and Wool Warehouse. Here a list of the colors I used for week 10. I hope to see you next week for part 11. Hallo Esther, ik ben heel blij met je video’s. Ze zijn heel duidelijk en ik print nu niets meer uit omdat ik het via je video veel sneller snap 🙂 Heel erg bedankt dat je het elke week doet! Thank you so much, it’s useful !